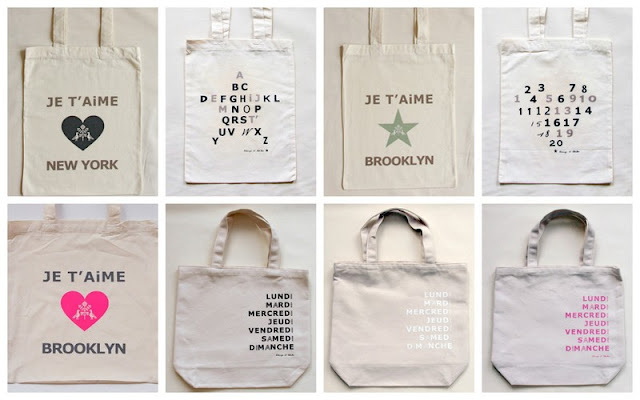 These perfect little tote bags from the Brooklyn-based apparel and accessory company Atsuyo et Akiko are so simple and sweet. I have had my eye on these for years, but the price tag prevented me from ever pulling the trigger. On the Atsuyo et Akiko web site today, these simple totes are only $5 a piece (retail price is $16)!! And the larger, more substantial day of the week tote (last three images above) is 50% off at $20 (normally $40). Shipping is $6.95 for any order up to $100. A couple of these totes made it onto Gilt.com this week, though their price is $15, one measly dollar less than full price. Buying form the source is a much better option today! Whenever we move to a new place (which has been often over the past 10 years), I like to join the local library as soon as possible. My kids love library outings and we always have a couple of designated "library totes" at our house. I think that these $5 beauties would be a perfect addition to our collection. So, if you haven't already, go join your local library and get yourself a new tote bag to mark the occasion! I think these $5 bags are gorgeous, but that they wouldn't hold library books well because of their build. A simple square stitch with no bottom for a block of books that need to sit flat on the bottom of the bag. I need a new library bag, but maybe I'll buy this and then swap around the other cloth bags I do have to use another one for library. Good point! I was thinking more of a few thin picture books for kids, but you're right about the lack of a gusseted bottom. The more expensive days of the week totes pictured in the post would probably be better for the library that the $5 ones!